Magnificent 7 . . ! The technical wizardry of the 175 years celebration model from Patek Philippe is the Grandmaster Chime 5175. 7 years in development and 2 years to construct, this video give just a hint at the incredible vision and skill to produce such an amazing timepiece. One will stay at the Petek Philippe museum collection, so that makes 6 (only 7 are to be completed) – so maybe that Christmas present you were agonizing over is not too late? The details I’ll leave to my friends at “A blog to watch” as it’s just a tad over my budget this year . . . . . . Another friend of mine said that it was about the size of his watch but heavier, I mean what’s better than my G-Shock? he said. . . If you haven’t seen it yet – here’s the video . . . .
Price I understand is (if you have to ask you’re out of your league) around $2.6mil – and no dud checks please! Another model for the woman in your life, especially if you are not concerned about price. Nice if you have no concerns, though for the rest of us mortals who worry about bills, then I’d look elsewhere – but of course dreams and love are what makes the world go around, so who knows? 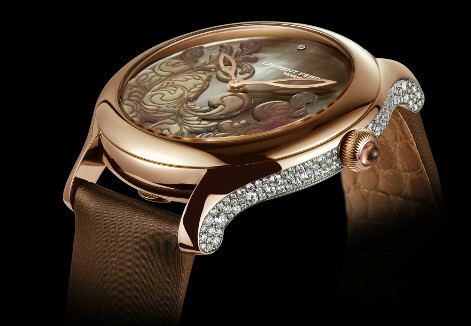 This is the Lady F from Laurent Ferrier – a Mother-or Pearl automatic masterpiece which includes the Galet Micro-Rotor. The case is a rounded 39mm to ensure a closer fit and comfort for a ladies’ wrist. As you see the dial is actually Mother-of-Pearl which in this case is stylized in texture and features “voluptuous arabesque motifs” according to Ferrier, “delicately interwoven foliage or refined detail of exquisite embroidery”. The dial also has a diamond @12 to enhance readability. The case itself is a beautifully sculpted affair with wonderful side panel in goodness knows what in stones (the web site doesn’t elaborate) though whatever they are, they look terrific. I also note the elegant little cabochon on the crown which compliments the dial. There is also an awful lot more going on in this watch than can be seen just in one image, but you can be sure it’s a special piece. Just got to make sure my better half (Wife) never sees this . . .
I’m dreaming . . . ! 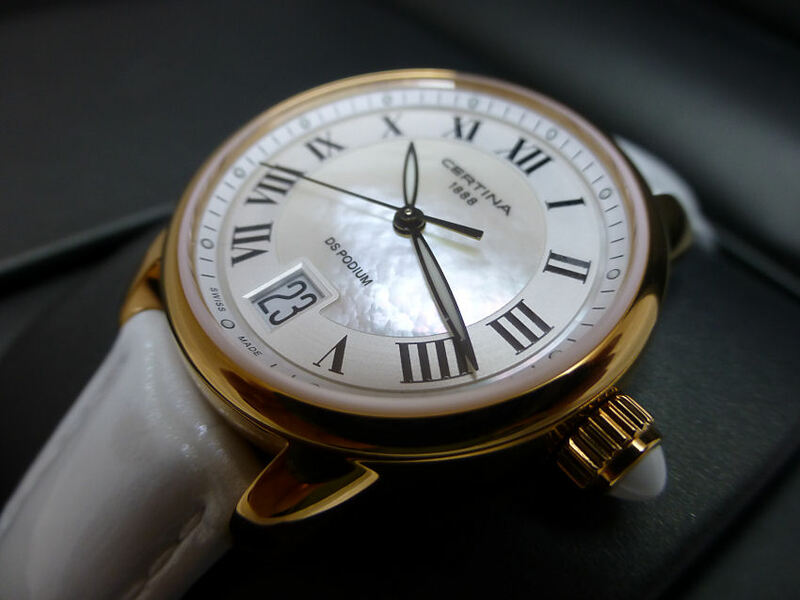 Note – For a mother-of-pearl dial ladies watch perhaps in a more realistic price range there is always the Certina DS Podium, which I featured recently. From one of the better Swiss Watch companies it makes extremely fine models across a varied price range. The DS Podium is a lovely watch, practical Quartz, elegant and yet very affordable. Because I like “aviator” style watches I thought I’d introduce this one Techné Instruments – the Harrier Automatic Cockpit Watch Model 363.090. One of the nicer Aviation style models around these day and in Automatic form represents extremely good value too. This particular version attracts me as it has a “Shark” super mesh link stainless steel deployment bracelet/strap, that lifts it from utility to officer class. I also like Techné as a Company as they are not averse to using what they consider appropriate for their needs. They are totally committed to good design, quality and value. The Harrier model is no exception as here they utilize the Miyota 9015, 24 jewel Automatic and as noted on the dial in small red script is the “Opus Manufactum” (Latin) expression, meaning “Hand Worked”. This applies to the whole watch, including the movement which has been regulated by Techné to surpass it’s standard accuracy of -10/+30 seconds per day, to just -4/+6 seconds, which is to COSC standards. The Harrier also features a scratch resistant Sapphire Crystal with a single AR Anti-reflective inner surface coating . The watch face itself is a nice matte color black and the large numerals at 12, 6 and 9 with the markers are coated with C1 Superluminova, as are the hour. minute and center sweep seconds hands. Note the identification aid to visibility dots either side of the 12, which is a throw back to earlier dials to aid clarity and orientation, when giving the dial a quick glance. Unobtrusive and highly effective. The dial is otherwise commendably uncluttered with only the addition of a decent size Date Window @3. The crystal is Sapphire scratch resistant. The hatched area to the left of the window is of course purely cosmetic and another reflection of the Instrument dials of altimeters in older aircraft cockpit instrument displays. But the small arrow to the left of the hatched area is an indicator of the direction of turn when using the crown during date changing, a feature I really like as I’m for ever turning crowns the wrong way on many of my analogue models, especially annoying of course if they feature day and date. The Miyota 9015 features hacking seconds of course so accurate “from the time signal” setting is easy and to the second. The watch dimensions are 41mm diameter (44mm with crown) by 51mm lug to lug and 11.1mm height, so a good sized model for once and one that should fit most wrists. The case is brushed 316L stainless steel and the 6mm wide well defined fluted crown is a screw down type, which is in line with the Water Resistance rating of 50m (5ATM). The watch back is exhibition which shows the Miyota movement, signed Techné, though to me, without much in the way of decoration seems a wasted opportunity. I like this model and with the mesh deployment bracelet gives it an elegance and sophistication not often associated with Aviator models, which is very pleasing and a consideration for my own collection. 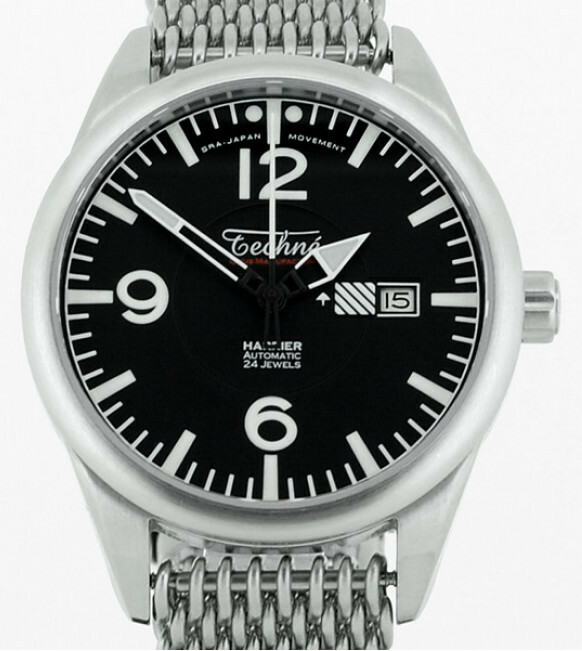 The Harrier 363.090 represents very good vale with features not often featured at this price point such as Sapphire crystal, AR coating and a COSC regulated Automatic movement and is available, depending on model variant, with either a high quality stainless mesh deployment bracelet or a tan oiled quality leather strap with buckle. Ladies it’s the thought that counts. 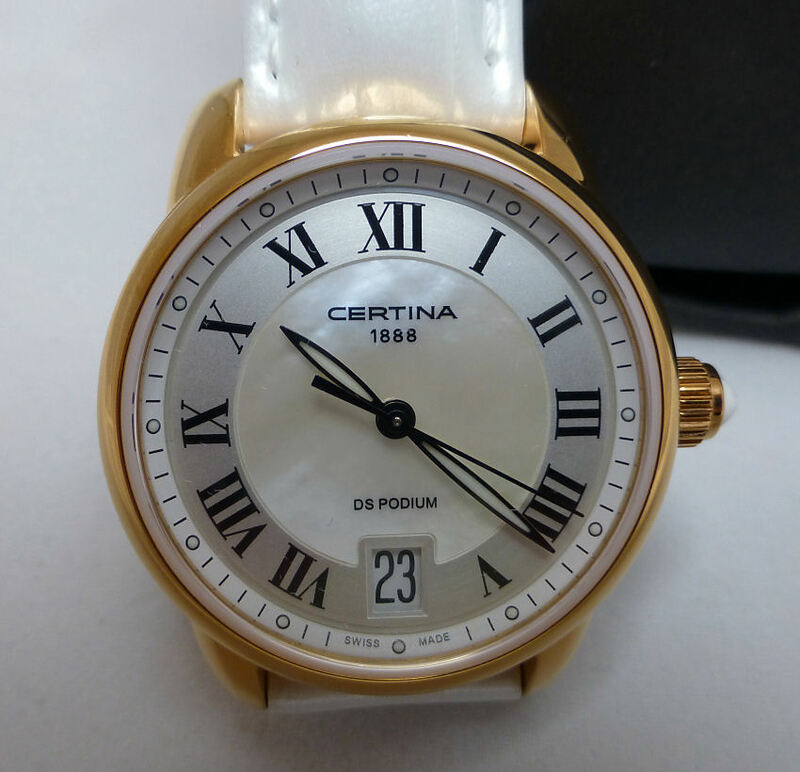 Well I said it a few Posts ago, when I discovered the very nice Certina Swiss ladies model. I thought maybe this could be a rather elegant gift for someone who hopefully like it as much as I – IF I got one . . . and as this someone is how shall I say, not the most careful when it comes to wearing watches. Most of her old ones have scratched glass, case and bracelets or manage to get water in them! So what do you do? and I know for a fact she does not like macho or utility, military or silly girlie watches and certainly not resin or plastic cased models at all! Anyway I thought the Certina DS system model I found the other week would be ideal. And with a little bit of difficulty I managed to get hold of one from a nice company in Germany who managed to get it fairly quickly as it happens and who sent it via DHL and it arrived today. 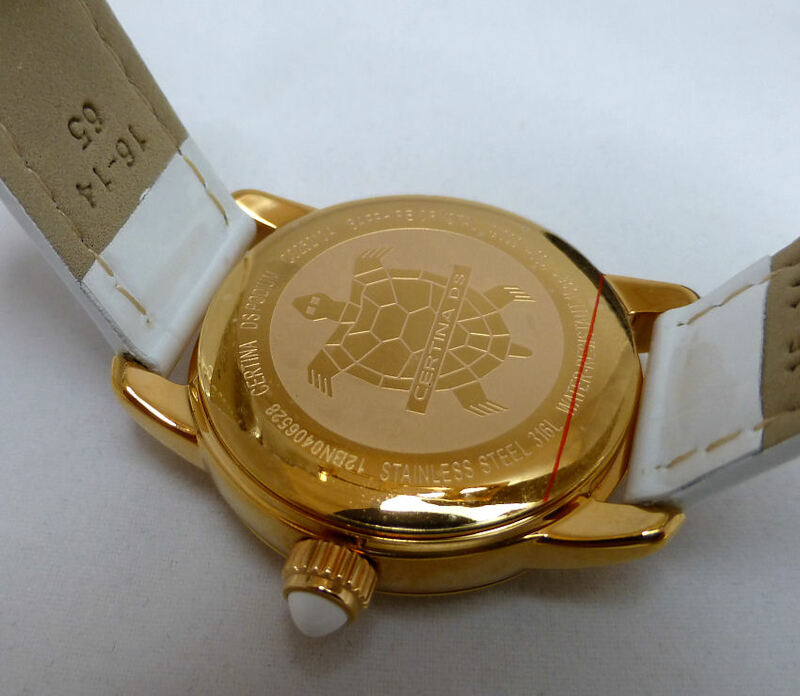 The model I’d looked at on that previous Post had a red strap with matching chapter, but I thought I’d go for Gold color with white as it was arguably that little bit more dressy. This is the Certina DS Podium 3 hand model with a Swiss ETA Quartz movement. 316L Stainless Steel case in gold color with a lovely Mother-of-Pearl and white dial layout with Roman numerals, elegantly shaped black outlined and luminous infilled hands and black centre seconds hand. Plus a Large Date window @6 which is unusual for a ladies model. Clear Sapphire crystal with ultra scratch resistance and one of the clearest dials for ladies I’ve seen and being in a DS configuration is surprisingly one tough watch. The Turtle motif denotes DS – classification. Excellent Water Resistance of 100m or 10bar – ‘o’ gasket on the stem, 2 x ‘o’ gaskets in the crown, special gasket on the reinforced case back ( I kid you not), plus excellent shock protection. The case dimensions are a neat but good size for Ladies at 32.5mm diameter x 8.86mm depth and the battery life is around 2 years including an EOL system (end of life) where the second hand jumps in 4 second intervals. 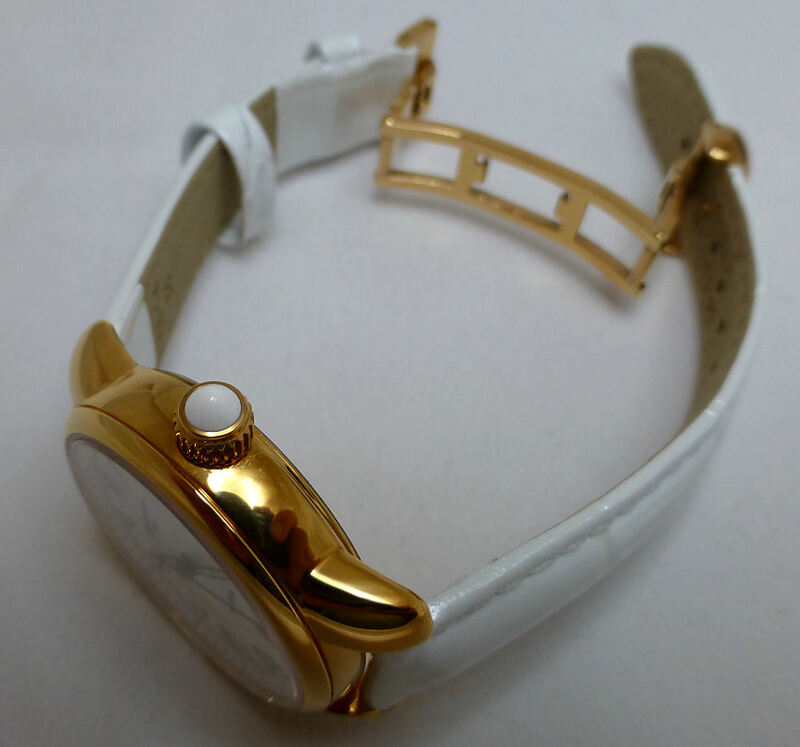 Quality leather strap in white with deployment closure. And to cap it all there is a 2 year Guarantee and the watch with it’s white matching cabochon on the crown looks every bit the dress watch that it is. Well I gifted the watch today (a special day as it happens) and that someone is absolutely delighted! Here the last image shows the clarity of this dial – a feature I’m particularly pleased about AND these elegant hands are luminous too . . . . So if you’re looking for a watch gift for your good lady or bad lady if it comes to it this year – Christmas is just around the corner – this is not a bad choice. It’s beautifully made, very attractive and elegant, will survive the pool but also look stunning at dinner – and doesn’t cost a fortune. Compass watches are always of interest to me, whether current or as in this case a Kickstarter project – which I understand is already fully funded and November this year should be available. Smith & Bradley are a fairly new US Company run by watch enthusiasts who decided that there was a niche in the market for a seriously practical model that might well be suited to the Law Enforcement profession or indeed any outdoor enthusiast too. This is the “Ambush” analog/digital model (I have a love of combi’s I admit) and this one appears to be pretty well specified. It uses a Swiss Quartz movement a digital display not unlike a Breitling Aerospace and a compass step motor function not unlike the Tissot T-Touch (though without the touch display). On first looks I rather like it. The 316 Stainless Steel 44mm diameter case (ex crown) is black PVD coated and the crystal is a coated Anti-reflection Sapphire. The case back is stainless steel and screw fit. 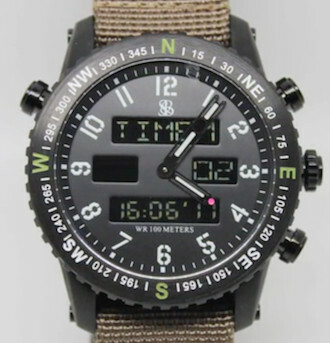 Function wise it features Alarm, Digital Compass using the analog hands as pointers, Dual Time and Chronograph. 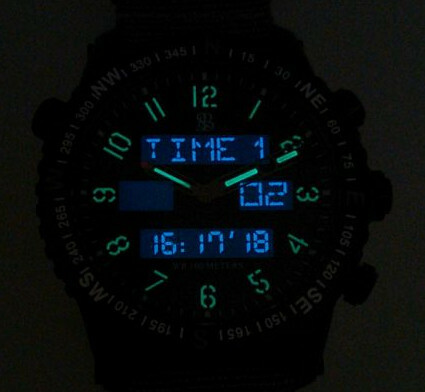 Great night vision – Superluminova analog and digital back light. It also caters for night use by having SuperLuminova analog hands and also a selectable blue digital back light which seems pretty good. Battery life is around 39 months (Renata) and there is a low battery indicator. The Compass mode uses the Minute hand to point to True North (there are declination settings you can set) and interestingly the Hour hand with the red dot shows your heading in compass mode. The digital display will show all data for direction and heading in degrees. I also like the fact (as in the night image) when the digital function is being used the analog hands will move out of the way to a default 10 -2 position, thus not obscuring the displays ( a feature of the Tissot T=touch also). So an interesting watch on many levels for me in that they are non mainstream and yet have put a lot of thought into their watch. They have used a solid Swiss ana/digi movement and planned out the features very carefully and avoided the pitfall of many larger Brands – dial clutter. This dial in comparison is neat, functional and very legible – and they have my congratulations. Another feature is they use standard lug strap arrangements so NATO and other standard alternative straps can be easily used. Again well done! 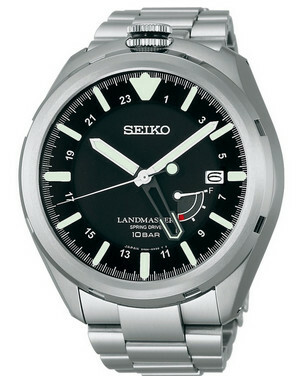 This model also feature a 10Bar (100m) Water Resistance. Sadly I never spotted this watch or indeed the Kickstarter promotion when it first appeared, so am very late to the table, but I’m sure once it appears and hopefully (or eventually) available to the general public – I’ll be there! which owing to the slightly unusual shape of the case looks pretty impressive size even at 45.0 mm wide and 14.2 depth and also maybe overly impressive in price at around £1800 to the UK. Not sure if the concept of Spring Drive sits well with me or not, though at this price I have to say it doesn’t make me want to rush out and buy one. Now OK it’s a nice watch with it’s excellent (so I’m told) 30 jewel Spring Drive 5R67 movement, good clear dial (clarity is a real plus with this model) with separate 24 hr hand, which is actually not intrusive being skeleton. Power Reserve indicator shows that it’s pretty good at 72 hrs and the black dial and white Lumibrite hands a very decent combination and with excellent night use. The crystal is Sapphire and has anti-reflection coating too and a decent size Date aperture @3. It also has a 100m Water Resistance with a screw back. I note the crown does stick out proud from the wrist once you strap it on, which is a consequence of the short lug arrangement, so it’s easily got hold of if nothing else. Interestingly being a Bullhead style with the crown @12 you would be forgiven if you thought his might be overly large from lug to lug – well it’s not and coupled with the shortened lug profile at 12 it’s actually only 46.8mm lug to lug, so will fit most wrists, even if it looks big and it is one of those models that does look bigger than it is. I confess I have a preference for models that even if they’re large, manage to look small on the wrist – this is something that this model does not do – but perhaps this is just me . . . . see video HERE. However one of the plus points is it’s solid Titanium so should at least be reasonably light and I’ve seen 140gms mentioned, so not too bad including the Ti bracelet with fold over clasp etc. Whilst the idea of Spring Drive first appeared way back it’s only since 1999 it’s been commercial and basically today that it’s reached the required performance currently demanded. Personally I would first consider a conventional automatic mechanical movement until I fully understood and see the actual benefits of SD. However at this moment in time I can get very good mechanical models for the same or less money, using tried and tested technology that’s also been around a long, long time. Interesting and quite impressive Seiko this may be, but I feel it’s looking too large on the wrist for me. 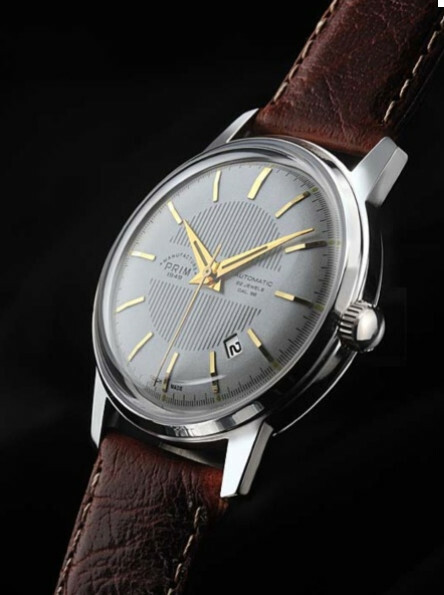 Another elegant watch, this time from Czechoslovakia – the PRIM Elegant 39C – Silver dial Date Watch. This has the Automatic Prim Calibre 98.01 22 jewel movement with a 46 hrs Power Reserve with Stainless Steel polished case, Date window @4 and a Sapphire Crystal. It also features a 50m Water Resistance. The name is apparently is an acronym derived from Precision, Reliability, Individuality – all Matchless according to their web site which seems a little simplistic, however the models do seem to be pretty decent nevertheless. 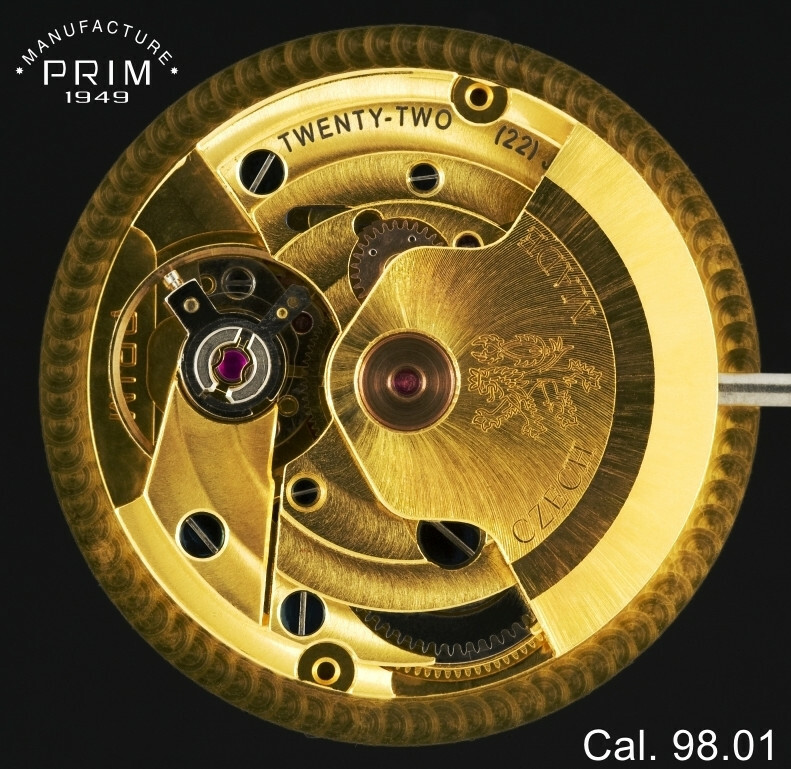 PRIM have their headquarters in the Czech Republic and manufacturing since 1949 and have created unique, custom-made watches ever since. They have a range of models and are also interested in customization for customers to create a unique model personal to the customer. The 98-01 movement has a stated accuracy of -6 to +24 s/day. For me this model which has been around since 2009 has the classic retro look of the 1960’s and 1970’s and OK perhaps nothing out of the ordinary, but I think I can call this one, especially as it’s name suggests it – an “elegant” watch and it does seem well constructed. And there’s something about those classic shaped models that just does it for me – maybe I’m old fashioned at heart, who knows, but I like this one. This model is quoted at around $4500 price so they have plenty of competition at this price point.